Home » What is a Bridle? A bridle (or cage, isolating column, bypass pipe, external chamber, etc.) is a vertical pipe connected to the side of a storage tank or process vessel typically with side/side or side/bottom connections. Because the fluid inside the bridle will rise and fall equally with the level of fluid inside the tank or vessel, the bridle has been adapted for level measurement on a broad scale. Term “bridle” refers to a bypass chamber on a larger process vessel on which the level instrumentation for that vessel is mounted. Bridles usually do not have level equipment extending into the bridle itself. Level equipment is typically placed in its own cage or nozzle attached to the bridle. Isolation: Because a level instrument mounted in a bridle is isolated from the process it can be calibrated or maintained without disturbing the process. Fewer Connections: A bridle reduces the number of connections necessary on the process vessel. This is especially important on boiler code vessels that require qualified welders and procedures. 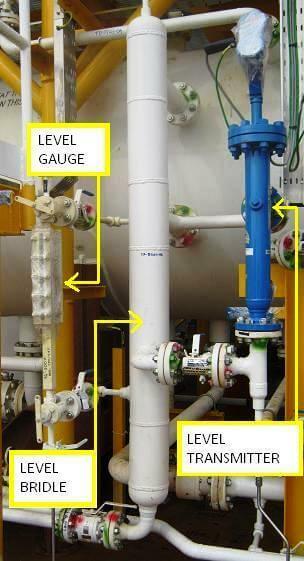 Prudent Design: Level instrumentation is often the last consideration on a project. Mounting the instrumentation on a bridle eliminates the need for planning multiple instrumentation connections on the vessel. Saves Time: Because instrumentation is typically left until the end, ordering a bridle with all the level instrumentation cuts down on the time necessary to add connections and install the instrumentation at the project deadline. Avoids Obstructions: When a tank has mixers, agitators, aerators, ladders, or structural bracing, a bridle avoids any interference between these objects and the level controls. Reduces Turbulence, Foam: In a highly agitated vessel, a bridle calms the surface to be measured and reduces foam to improve measurement accuracy. Guided Wave Radar GWR mounted in a cage is well suited for bridle measurement. Configuration is fast and accuracy isn’t affected by changing densities, dielectrics, high temperatures or high pressures. Magnetic Level Indicators Developed for the most demanding industrial applications, MLIs provide local visual indication and remote indication when combined with a transmitter. Highly visible flags magnetically coupled to the moving float provide local level indication. Magnetostrictive Transmitters Designed to attach quickly and easily to magnetic level indicators, magnetostrictive transmitters offer high accuracy and high linearity when combined with MLIs. External Cage Float Switches A wide range of float switches suitable for bridle applications with flanged and sealed cage designs include ASME B31.1 construction for boiler and power plant use and B31.3 construction for petrochemical use. Displacer Controllers Displacer Controllers utilize simple buoyancy principles to detect and convert liquid level changes into a stable output signal. Modern displacer controllers serve most liquid level measurement and control applications including those with varying dielectric, vapors, turbulence, foam, buildup, bubbling or boiling and high fill/empty rates. Ultrasonic Contact Point Sensors Nozzle-mounted ultrasonic switches are mounted horizontally on bridles for high or low level alarm applications. Thermal Dispersion Point Sensors Nozzle-mounted thermal dispersion switches provide a high level of performance for level and interface applications on bridles.